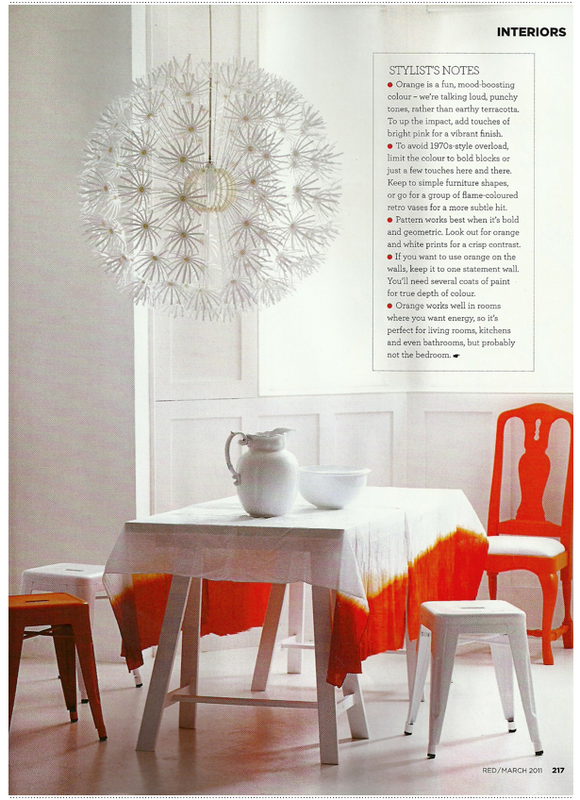 The moment I read the orange colour story in the interiors section of Red's March issue I knew I wanted to share it here on Bright.Bazaar. 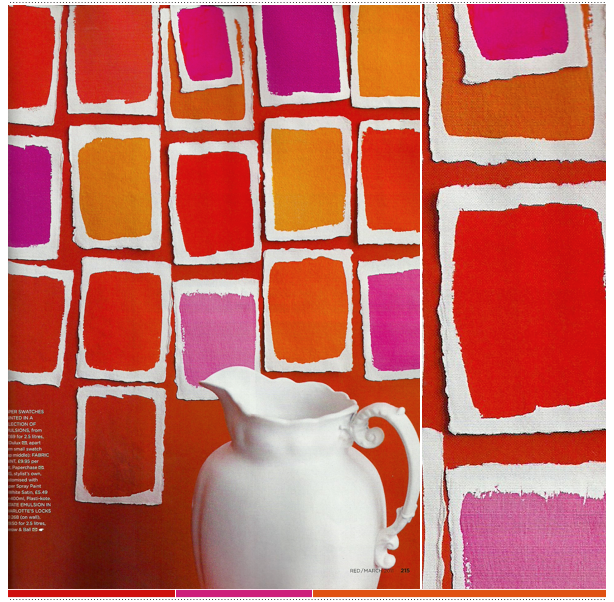 Exotic, uplifting and unforgivingly bright, the editorial - styled by Mary Norden and shot by Polly Wreford - is an inspiring guide on how to use orange in your home. 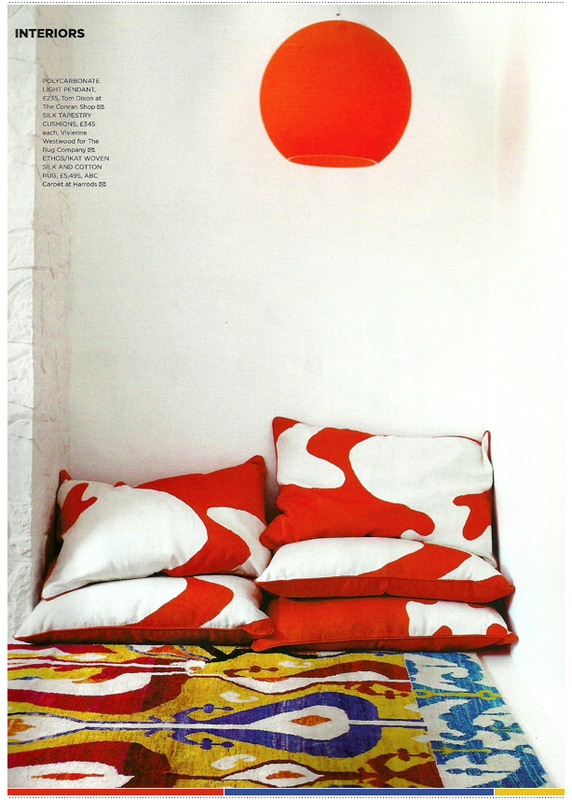 From textiles to paints there's plenty to ignite your mind when it comes to this fiery hue. 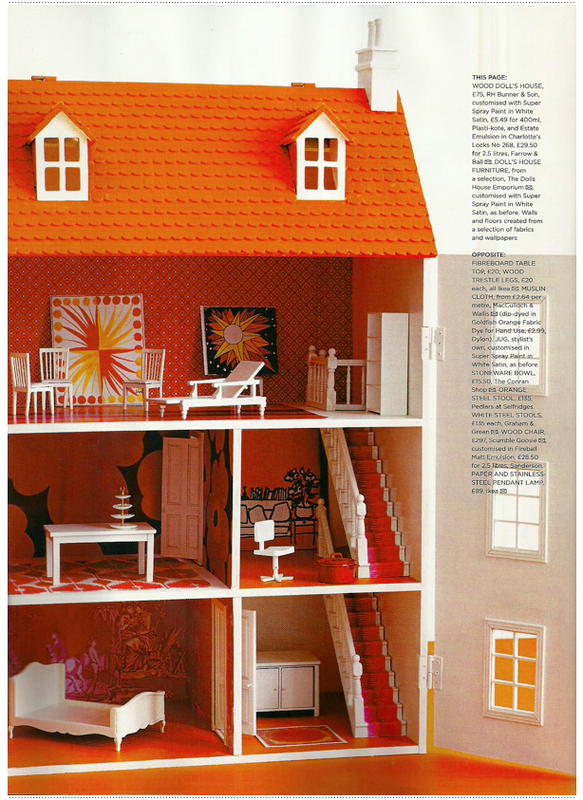 Plus, how cool is that doll's house? That's what I call knockout styling! As well as the feature, I've put together some market picks in case you feel like a spot of shopping. Well, it's mid week so we could all do with a little treat...! I adore your market pics Will. I see the work you put behind every post and hope you know it's all so appreciated. Gorgeous colours indeed. A wonderful post yet again my fellow bright blogger! I'm loving the dinning room with the large dandelion chandelier and the 'ombre' style tablecloth- so bright and beautiful! What a great issue! 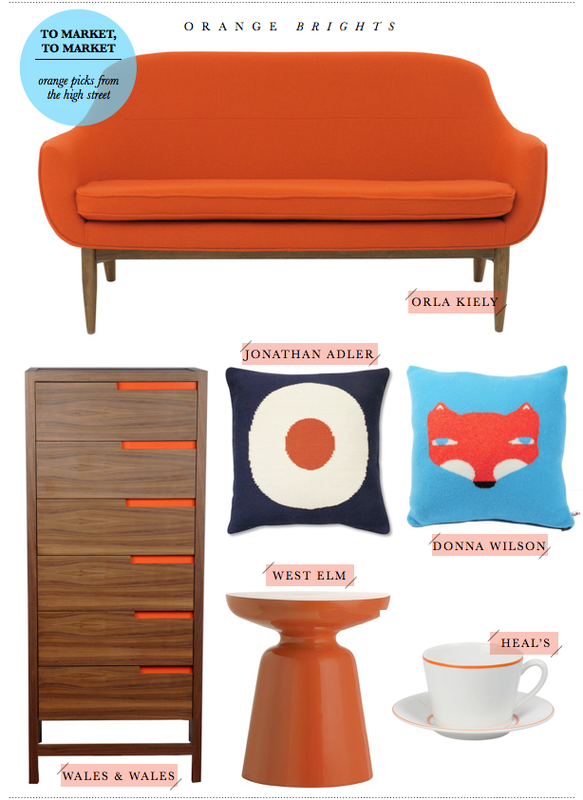 Orange is my favorite color so I'm just thrilled to find so many cool items, like that darling fox pillow. Thank you so much for sharing! I've never been a fan of using all those warm colors together (red, orange, pink), but think there are some examples here that are really wonderful. I would love to steal little pieces here or there for my own use! 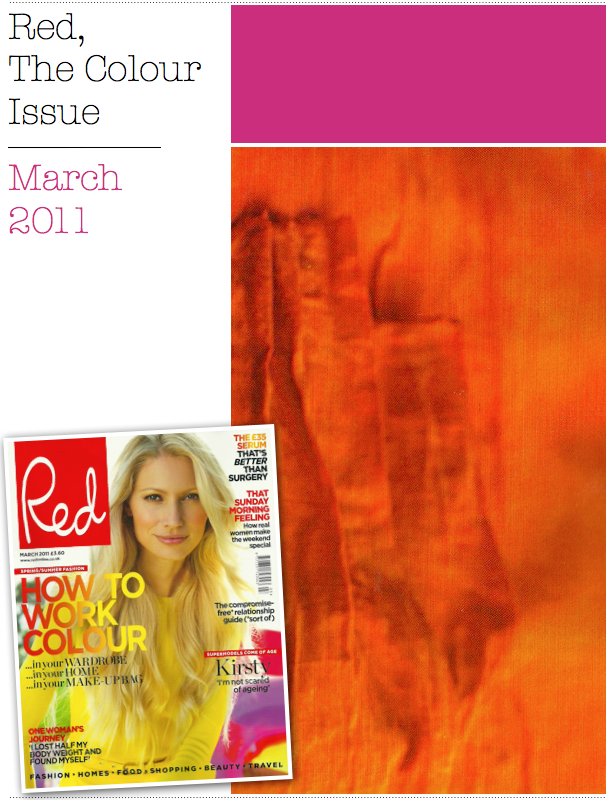 Red, has always some great articles and features and you my dear always the best reviews! Did you get your Donna pillow? you have a color convert here. the combination of red or pink and orange is divine! all those colorful pillows are making me want to redecorate the spaces in my home! The doll house is amazing! I love vibrant colors and orange is a favorite. I wasn't familiar with this Red magazine, it's fantastic! Michelle is so right Will, a beautiful job setting up your layouts for your posts! Love that orange, red and pink! Love the cheerful brightness these warm colors bring to the room! I love this combination raspberry orange, too! Great pictures! Gotta love that orange doll house! And the yummy pillows on that sofa. And most of all that artwork. Thank you for this cheery &chic post. It's all just so juicy! And subsequently reminds me of tangerines, which is a GREAT thing. Red is such a punchy and sweet addition to anything in life. Be that the mouth, the feet, the decor or the food. Love love it! The dye dipped table cloth is fantastic! As are those swatches. Such an easy but impactful way to create a wall statement! Hoping you are well my friend. Missing you over at my corner..
Yeehaaa- color! Is there anything more uplifting? Between this mag and HB, I'm absolutely dying over all this pink!!! More! More! I never tire of orange and pink...such a vibrant combo! what a seriously beautiful post. that wales & wales chest is stunning, i would die for that orla kiely sofa... i could go on and on. Oh my goodness Will ~ how did I miss this fab post on that most glorious of all colours: orange? Luckily for me, Sanfranciscogirlbybay raved about your post so I trailed over to find it. 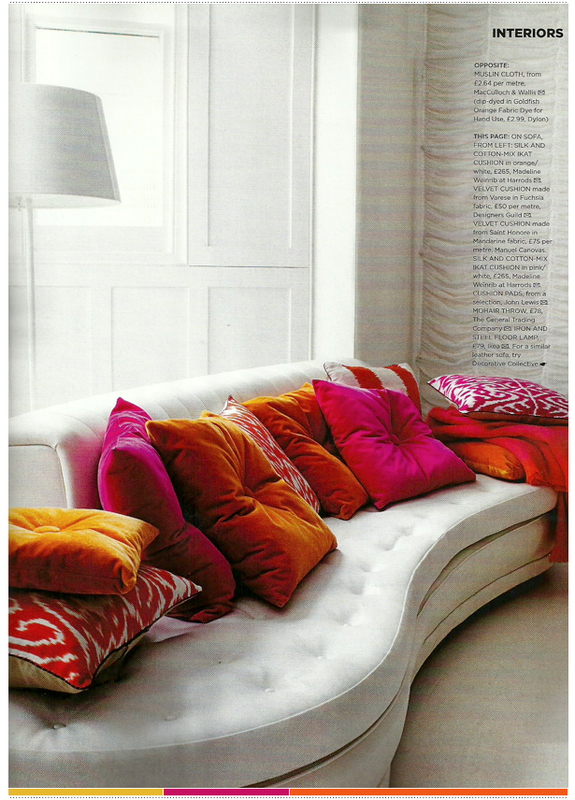 That sofa with the orange, pink and red cushions is SO wonderful - it packs a punch of happiness in every glance. I love my bright orange velvet sofas ~ they always raise a smile from visitors. Thanks a ton Will unbelievably have only just discovered Bright Bazaar and already am hooked! Orange with fuschia - I grew up seeing the most stunning silk sarees in that colour combination! Always thought there was a decorating trend in there somewhere. Which is why our signature 'Men in Turbans' cushion pays homage http://www.plumchutney.com/men-in-turbans-cushion.html.